Singapore has the largest percentage of millionaire households in the world. While the rest of the world has been in flux during the crisis, millionaires are just sprouting up left and right in this small country of less than 4 million people. Driving the streets of Singapore feels a bit like Monaco. Flashy Lamborghinis, Ferraris and Aston Martins zoom (to the restrictive speed limit of 80km/h) all around the city. It feels more like a car show than reality. There are also many high end malls in this country . Fancy shopping opportunities are everywhere. Holiday lights are still blinking and twinkling at night in this 30 degree Celcius weather. “It’s still time to be merry and spend money!” they seem to indicate. Singapore seems to revolve around showy bling and spending money. And good for them…it’s just not my normal cup of tea. They want fine china. I want a homemade clay cup. I stayed in Singapore’s Chinatown, which had a more interesting feel to it than downtown. My hotel was right next to a Hindu temple where an elaborate celebration of Thaipusam was going on. People were walking through the streets with jugs of milk, which apparently represented their burdens to carry, and chanted as they moved down the winding roads. It was loud, festive and the incense smelled just like India. This is stuff I want to see! Not perfectly manicured trees with each branch shooting off in the same direction, or perfect semi circles of flowers and grass.. Or gum-free sidewalks. That’s all well and good…but Chinatown was really bustling and way more interesting than the tropical Santa lights downtown. So I pushed all coconut related feelings aside and plunged my plastic spoon into the aromatic grains. I mixed each bite with chili: earthy fish, a bit of sweet tuber, and a touch of pungent vegetable. I was in tropical flavor heaven. It was so satisfying that I didn’t even think 3 times about my meager portion of rice (I felt 2 times was an adequate reflecting period). 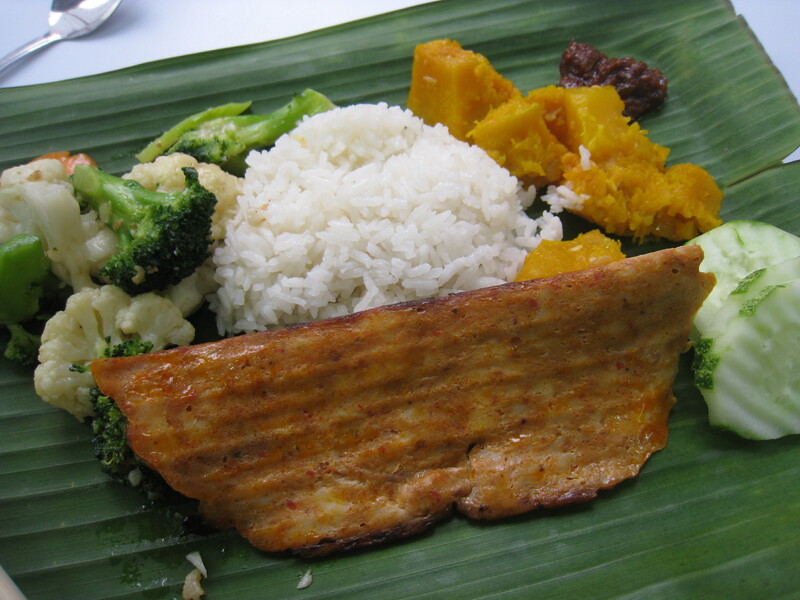 And to make things even better, my ‘plate’ of food (actually served on a banana leaf) cost me all of $2.50. Now we’re talking, Singapore. I ate another great late night snack on my last night there. 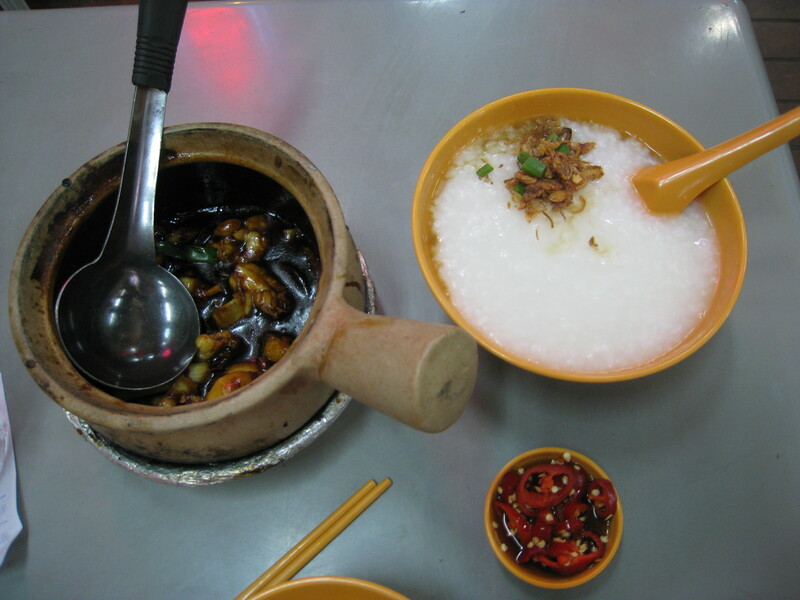 I figured I’d go really healthy and order the clay pot of frogs’ legs and a massive bowl of porridge. Maybe not really healthy, but it was my last night in Singapore! (I need to start thinking of better excuses… ) Anyway, the serving size was definitely enough to feed a small family. I looked at the bowls and portioned mentally how much I should eat. But as per usual, I tasted the heady braised meat and before I knew it, it was all gone! Whoops. The legs were so tender that the meat just fell of the bones. The rich sauce was laden with fried chilis and ginger, so it wasn’t incredibly hot, but it was intensely smokey in essence. The porridge was littered with scallions and fried shallots, and red chilis were on the tables for your heat adjusting pleasure. For $4.30, I ate a hearty dish that didn’t skimp on bold flavors. As much as I enjoyed it at the time though, I can’t say I woke up feeling great about the porridge that was still sitting heavy in my stomach. Ah well. When you’re in Singapore, do as the Chinese do, right? I think that’s the take away message here. On our way to the airport, we made a detour at Arab Street. Rob was telling me that it’s one of the last real cultural areas left in the city. But even this Muslim populated neighborhood is being encroached upon, day in and out, by those who want to gentrify and turn charming old restaurants into PR firms and boutique coffee shops. We went to his favorite restaurant called Zam Zam and ordered tons of food. The kind of food that makes you want to roll off your seat and onto the floor and have someone rub your tummy. We ate crispy chicken, a murtabak griddled in oil, curries, a touch of veg, and washed it all down with sweet tea (which was really just sugar and a touch of tea. Delish!). The food, albeit rich, buttery and heavy is worth eating even in tropical climates. Sure, a mutton murtabak probably tastes better in a cooler climate, where you can really appreciate the heaviness of the dish. But go ahead and try one anyway. It’s part of the local scene…and the humidity doesn’t make it taste any less delicious. It may just be harder to see it through the sweat dripping past your eyes. So if you must come to Singapore, and you’re not a huge shopper, head to either Chinatown or Arab St. and explore the small shops, the hawker areas, the hookah lounges and the food cafes. You’ll not only get some delicious eats, but more importantly you’ll feel like you’ve been on a mini adventure and discovered ancient treasures (yes, mutton counts as a treasure). A few dollars in your pocket might not put you on the same footing as all the thousands of millionaires in Singapore, but who cares. You’ve got coconut rice!